Youth leaders from different organizations in the National Capital Region geared up for the advocacy to end child marriage in the Philippines by participating in a three-day policy advocacy training for youth leaders tagged “Too Young, Too Soon,” held on July 4-6 at Venus Park View Hotel, Baguio City. The activity was organized by PLCPD through the Creating Spaces to Take Action on Violence against Women and Girls project. 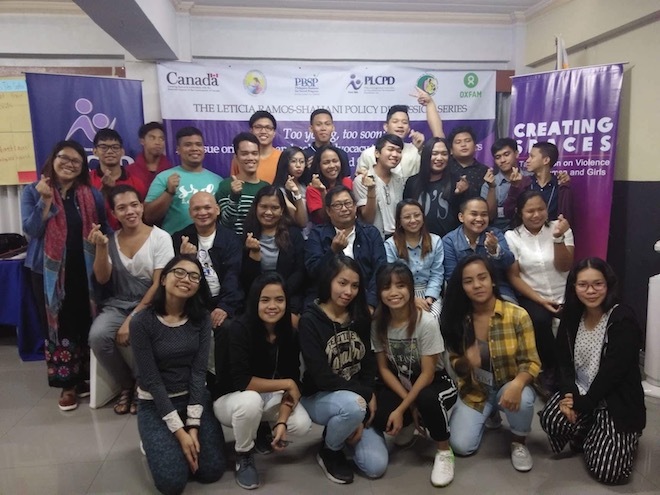 Youth leaders from Center for Social Action of the De La Salle College of Saint Benilde, YPEER Pilipinas, Pasay Youth Development Office, Barangay Culiat, Virlanie and ERDA foundation were the participants in the three-day training. Mr. Romeo Dongeto, PLCPD’s Executive Director, in his motivational talk, encouraged the youth leaders to be in the frontline for this advocacy. PLCPD discussed the importance of human rights and highlighted the significance of fighting not just for one’s rights, but for the rights of all young people. This was followed with a discussion of international and legal frameworks prohibiting child marriage, which emphasized the importance of a national policy that prohibits child marriage, without exceptions. To prepare the youth leaders as advocates, a discussion on advocacy and the national legislative process and its advocacy access points were discussed. Youth leaders were also equipped with policy advocacy skills such as stakeholders analysis and political mapping, message development, utilizing social media, person-to-person advocacy, and advocacy planning. The training was conducted as a part of the series of capacity building activities aimed at building awareness and increasing participation and involvement of young people in pushing for policy reform to end child, early and forced marriages. 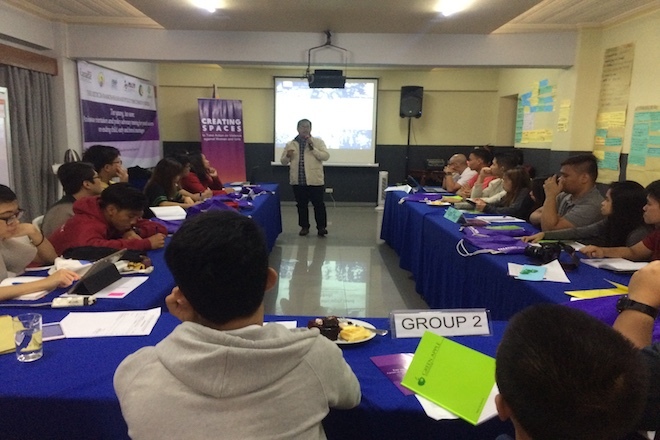 The first policy advocacy training was held in Cotabato City, in which youth leaders from the municipalities of Guindulungan, Mamasapano and Datu Saudi Ampatuan in Maguindanao were the participants. It was followed by the Iligan City leg, in which youth leaders from Marawi City and the municipalities of Bubong and Saguiaran, Lanao del Sur participated. 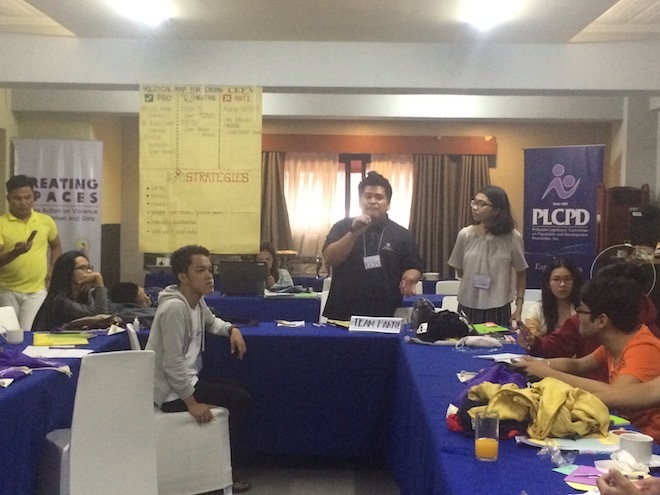 PLCPD is part of the Creating Spaces to Take Action on Violence against Women and Girls project, together with Oxfam, Al-Mujadilah Development Foundation, and United Youth of the Philippines-Women, supported by Global Affairs Canada. A campaign across six countries in Asia, Creating Spaces aims to prevent violence against women and girls and reduce the prevalence of child, early and forced marriage.